Hotel Bergblick *** in Ratschings is the ideal choice for those who want to take a break from stress of everyday life. To welcome you comfortable rooms, relaxing family atmosphere and many amenities to make your vacation truly memorable. All our rooms are tastefully decorated and offer beautiful views of the surrounding nature. The rooms are equipped with shower, toilet, TV room safe, telephone. 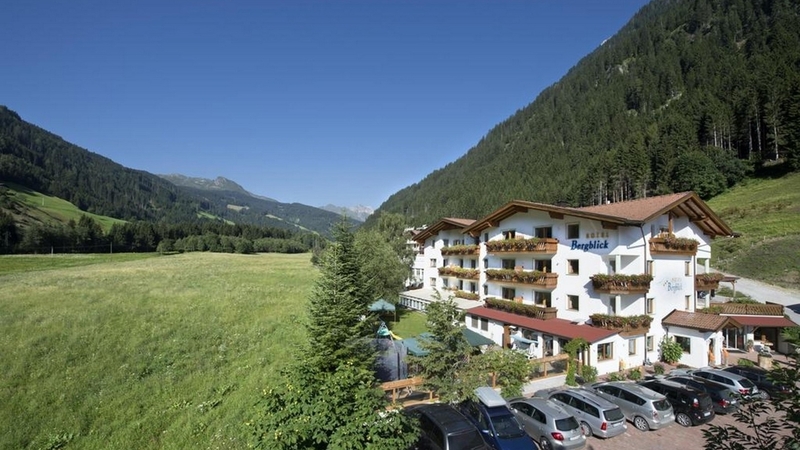 Hotel Bergblick*** is the ideal holiday destination all year round! In summer you can devote to many beautiful hiking and bike tours, while in winter you can ski on the slopes of the ski resort of Ratschings-Jaufen. Upon your return, you will find to pamper you our oasis of well-being where to spend pleasant hours with swimming pool, sauna, turkish bath, jacuzzi, water beds and numerous wellness treatments. You could not miss the delicacies prepared daily by our restaurant as traditional and international dishes and special nights organized for you like the Gala Dinner and the Tyrolean Evening. Family Eisendle will be pleased to welcome you to the Hotel Bergblick as soon as possible! The approximately 18-20 m² large rooms offer enough space for up to 2 people. The balcony is directed towards the south so you will benefit around noon and in the afternoon from the warm and refreshing sunshine. In the 25 – 30 m² large rooms up to 3 people can find enough space to relax. The view from the balcony is directed towards Ratschings eastbound. The approximately 25 – 30 m² large rooms are equipped with an additional bed sofa and are therefore suitable for 3 people. On the balcony you can enjoy the sun. The approximately 23-25 m² large double rooms have an additional bed sofa and are suitable for up to 3 people. The view from the balcony or the terrace is directed towards the north. In addition to the double bed in the approx 31-37 m² large family rooms there is a double bed sofa. 4-5 people find enough space to relax. The view from the balcony or from the terrace is directed towards the north. Babyphone, Vegetarian food , Home made products, Bike rental, Gratis Skibus, Sunshade, Deckchair, Ski depot in the house, Hiking Guide, Journals at disposal, Multilingual receptionists by day, Shuttle service (train station, airport), Snow boot dryer, Family-friendly, Packed lunches, Quiet position, Shops in the environs, above 1000 m a.s.l.